This is a link to the official site of the governing body in Australia. It contains a wealth of information including contact details for all registered quartets and choruses in Australia, past contest scores, the “In Harmony” newsletter, BHA constitution and by-laws, and a number of other useful documents and manuals. This is THE first place to look for everything barbershop. It is the official site of the American Barbershop Society, has a history of Barbershop, current news, competition records, and a wealth of educational materials both for individual singing, quartets, and administration. It also links to one of the largest collections of sheet music in the world. Are you wanting to find some good quality clips of Barbershop performances on YouTube, but don't know where to start? Try the BHS YouTube channel. They also sometimes post usefull educational clips, amongst other things. This is the official store for the BHS where you can purchase everything from sheet music, learning tracks, pitch pipes, books, and CD's/DVD's of barbershop performances and groups, to key chains and beer glasses. It has one of the biggest collections of sheet music in the world. 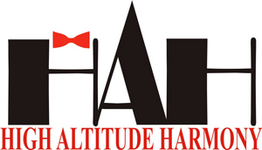 This site attempts to provide a single point access for the history of barbershop competition covering quartets and choruses for the BHS, the Sweet Adelines International, and Harmony Inc . The AIC is affiliated with the BHS, but membership is open only to quartets who have won the BHS International Quartet Contest. They aim to be the finest ambassadors, educators, and promoters of barbershop quartet singing in the world. This website has details on every past quartet champion. Want to sing a tag? This site has almost 3000 downloadable tags, including learning tracks for each voice part of all 125 "Classic Tags", the world wide de facto standard collection of barbershop tags. There are a number of websites offering learning tracks apart from those available on Harmony Marketplace. Perhaps the most well known is "Tim Tracks". Operated by Tim Waurick, tenor from 2006 quartet champions Vocal Spectrum, this site has over 1000 top quality learning tracks available for male, female and mixed arrangements. If you can't find a learning track you want at HM, this is a great place to start looking. Want to learn how to read music better, or try to understand music theory? This fantastic interactive website provides a step-by-step lesson plan to take you from the most basic elements of music notation to full on musical analysis. Not only that, it provides training tools to help you identify intervals and chords by ear. This is an excellent free music writing application. Easily create your own music or learning tracks. There is an excellent tutorial available to help get you started, but once familiar with that, it is fairly straight forward and easy to use. More excellent free software, this time for editing audio tracks. Compatible with most common electronic formats, Audacity will help you mix and match multiple tracks. If you need to practice one bit of a song, just use Audacity to cut out the part in question and create a “mini” learning track.